Vancouver, B.C. 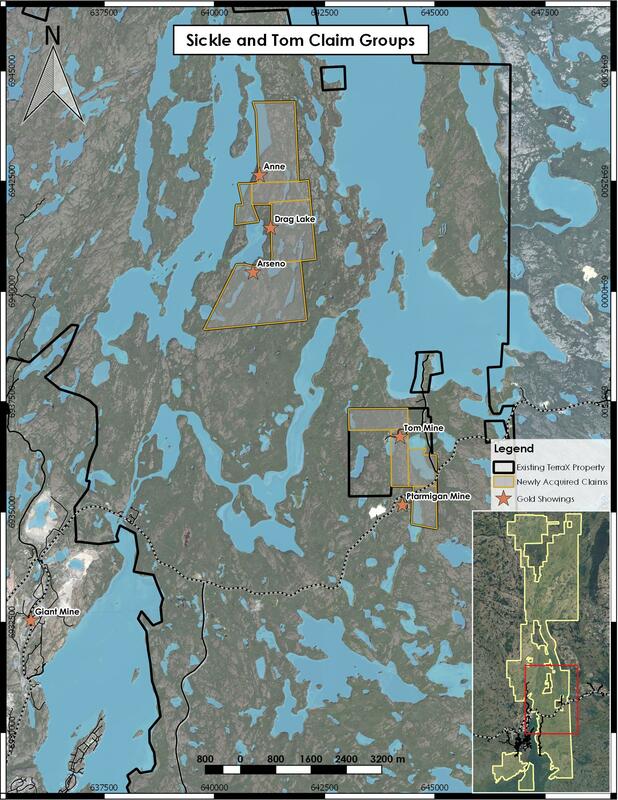 – TerraX Minerals Inc. (TSX-V: TXR; Frankfurt: TX0; OTC Pink: TRXXF) is pleased to announce the purchase of a 100% interest in the Tom Mine (6 sq km)and Sickle (2 sq. km) properties from Altamira Gold Corp. These properties increase the area of the YCGP from 772 square kilometers to 780 square kilometers. A map of the property locations is available here. The Tom Mine was a gold producer in the Yellowknife gold district from 1985-1997. The Tom and C vein systems were accessed by ramp to 122 vertical metres over 300 metres of strike length. The Tom Mine production was milled at the Ptarmigan Mine (January 12, 2018 press release) so separate production records for the Tom Mine are not available. The Tom Mine gold ore has the same characteristics as the Ptarmigan Mine which is free milling with reported recovery of 94%. When the mine closed in 1997 the veins were still open at depths below the current mine workings. (Source: The Operational History of Mines in the Northwest Territories, R. Silke, 2009; and Treminco Resources Limited, Annual report 1990). The southern portion of the property is contiguous with the Ptarmigan Gold Mine property.